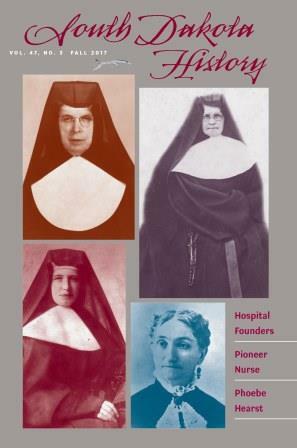 Hospital founders, philanthropists and a pioneer nurse are featured in the Fall 2017 issue of “South Dakota History,” the quarterly journal of the South Dakota State Historical Society. The life and legacy of Phoebe Hearst is explored in “Philanthropy as Cultural Outreach: Phoebe Hearst and Music in Lead, South Dakota” by Leta E. Miller. Hearst, the mother of newspaper mogul William Randolph Hearst, inherited the family fortune after the death of her husband George in 1891. This wealth included stock in the Homestake Mine in Lead, S.D., where she became a major community benefactor. Hearst enriched the lives of area citizens through the development of cultural and musical activities, including world-class concerts at the Hearst Free Library and Homestake Opera House and Recreation Center. Miller is a professor of music emerita at the University of California and author of numerous works on 20th-century American music. “South Dakota History” is a benefit of membership in the South Dakota State Historical Society. For information on membership, call 605-773-6000. To purchase individual issues, call 605-773-6009.